The above grants have all required a private match, typically on a 1 to 1 basis. 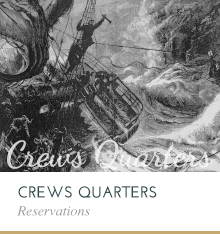 The only source the Shipwreck Society has for matching funds is the private sector. Contributions to historic restoration projects at Whitefish Point are tax deductible. 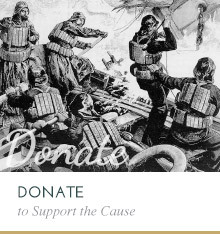 For information on making a contribution, please visit the contact information section of this page. The Whitefish Point “iron-pile” lighthouse was constructed to replace Whitefish Point’s original stone tower which existed from 1849 until 1860 – the severe winds experienced here proved too much for its basic masonry construction. The tower has had a series of lenses illuminated by a variety of methods. In August 2011, the U.S. Coast Guard replaced the 1968 Crouse & Hinds aerobeacon with a state of the art 15-mile LED lens; the lens immediately preceding the aerobeacon was a third and a half order half-bivalve Fresnel lens that functioned from 1895 to 1968. Commercial electrical service did not arrive at Whitefish Point until 1939. The Shipwreck Museum is currently seeking private contributions to complete light tower restoration, to match funding from the Michigan Lighthouse Assistance Program. Phase I of this two-phase project was completed in December, 2009. Phase I finished all restoration work from the top of the lantern room roof down to the bottom of the watch deck. Phase II, that includes all exterior work from the foundation to the middle horizontal plane just above the walkway roof commenced on August 29, 2011. Individual steps of the spiral staircase inside the light tower cylinder may be purchased for $250 each for donors to name an honoree, themselves, or someone as a memorial. Please see contact information if you are interested. To make an online contribution to the Light Tower Restoration Project right now, simply click Online Donations. 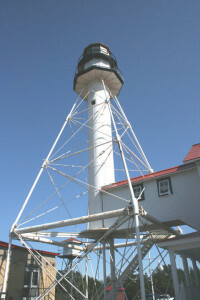 The famous Whitefish Point Light Tower is exactly 150 years old in 2011. It is the oldest operating lighthouse on Lake Superior, providing its life-saving beacon across the waters continuously since 1861. Today, this lighthouse remains a fully commissioned U.S. Coast Guard Aid to Navigation. 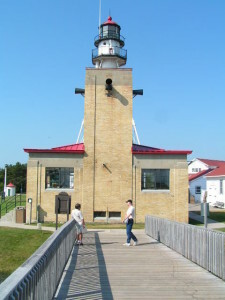 Shipping companies firmly state that while modern electronic navigational methods as GPS and radar are of great help, it is still very important to be able to see this lighthouse as they approach the relative safety of Whitefish Bay. While the U.S. Coast Guard operates the light, it no longer owns the historic tower. The tower, and its upkeep, are the responsibility of the Great Lakes Shipwreck Historical Society. 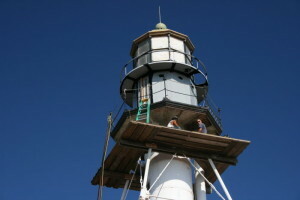 The Shipwreck Society is addressing Light Tower Restoration in three phases. Phase I, that included the Lantern Room, Watch Room, and all interior and exterior areas above the watch room deck, was completed in 2010. The Society is now raising funds for Phase II. Phase II includes restoration work from the foundation up to the middle horizontal structural plane just above the walkway roof. Phase III, scheduled for 2012-2013, will complete the remaining upper skeletal structure. A generous grant of $40,000 from the Michigan Lighthouse Assistance Program partially supported Phase I, and a second $40,000 grant is partially supporting Phase II. The Shipwreck Society is selling Light Tower Stair Designations at $250 each for those who wish their names associated with the preservation of this historic lighthouse. 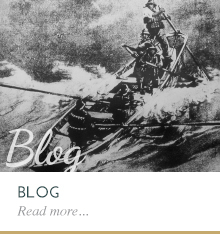 Please click here to visit an area of our web site that provides more detailed information. Please click here to visit our Donations Page to make a contribution to Save the Whitefish Point Light Tower. All contributions are welcome and are tax deductible. 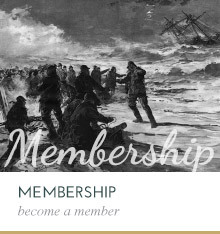 It is not necessary to login nor be a member of the Shipwreck Society to make a donation. Light Tower Stair designations are also available at $250 each for patrons to remember or honor someone. To find out more about this opportunity, please call the Development Office, Great Lakes Shipwreck Historical Society, at 800-635-1742. 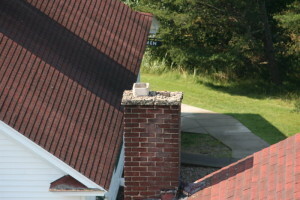 One example of a current restoration need is the deteriorating chimney and roof of the 1929 U.S. Navy Radio Station Barracks Building. This building was purchased by the U.S. Lighthouse Service from the Navy, acquired by the U.S. Coast Guard, and moved from the Radio Station property – 1000 yards south of the light station – to its present location in 1937. The Coast Guard converted it to an Assistant Chief’s Quarters. It is now used as the Shipwreck Museum Video Theatre building and for display of the MDOT Underwater Documentation Project exhibit.